Posted on 12/24/2010, 11:47 am, by jungrrl, under Handmade Gift Ideas. In these last few hours before the big day we’re here to help! 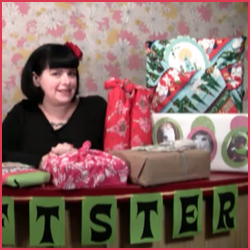 We’ve got a great Craftster Quickies video tutorial all about gift wrapping. Kittykill will show you how to jazz up regular paper wrapping with stamps, punches, and bows. She’ll also give you full instructions on how to wrap your presents with fabric! It’s a great way to make those wonderful holiday gifts really stand out!